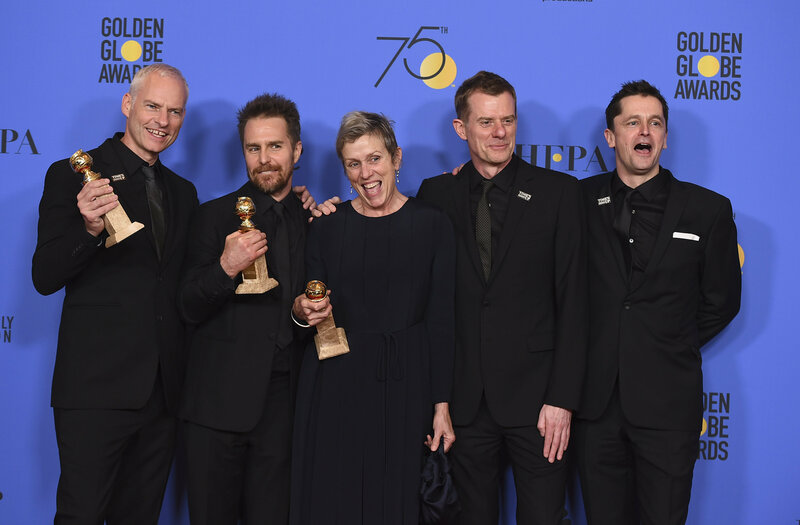 The French drama "Three billboards outside Ebbing, Missouri" enjoyed the best possible luck in the ceremony, It took home as many as four globes from the 75th annual Golden Globes. It won best motion picture (drama) as well as best screenplay, best supporting actor and best actress (drama) for Frances McDormand, who in her speech hurried to support women fighting sexual predators. — BFI (@BFI) 8 января 2018 г. "I keep my politics private, but it was really great to be in this room tonight, and to be part of a tectonic shift in our industry’s power structure," said McDormand. "Trust me: the women in this room tonight are not here for the food. We are here for the work." The cast and crew of "Three Billboards Outside Ebbing, Missouri" from left, Martin McDonagh, winner of the award for best screenplay - motion picture, Sam Rockwell, winner the award for best performance by an actor in a supporting role in any motion picture, Frances McDormand, winner of the award for best performance by an actress in a motion picture - drama, and Graham Broadbent and Peter Czernin, pose in the press room with the award for best motion picture - drama at the 75th annual Golden Globe Awards at the Beverly Hilton Hotel on Sunday, Jan. 7, 2018, in Beverly Hills, Calif.
"I want all the girls watching here, now to know that a new day is on the horizon," she said. "And when that new day finally dawns, it will be because of a lot of magnificent women, many of whom are right here in this room tonight —and some pretty phenomenal men — fighting hard to make sure that they become the leaders who take us to the time when nobody ever has to say #MeToo again." — Maureen Devlin (@lookforsun) 8 января 2018 г. Her socially, or rather politically charged speech, which some media outlets referred to as the "emotional anchor" of the night, dominated the ceremony and was closely followed by others. Natalie Portman, for instance, while announcing the nominees for best director, went off-script to note that each one was a man. Meanwhile, host Seth Meyers in his opening monologue, sent verbal jabs at a range of characters whose reputation has been irrevocably marred recently, namely Kevin Spacey, Woody Allen and, of course, the notorious Harvey Weinstein. "Don’t worry, he [Weinstein] will be back in 20 years when he becomes the first person to be booed at the annual In Memoriam," Meyers quipped. He made his point rather explicit: "It’s been years since a white man has been this nervous in Hollywood," Meyers said. "For the male nominees in the room tonight, this will be the first time in three months it won't be terrifying to hear your name read out loud." No less indicative were the black ensembles that attendees donned accompanied with 'Time's Up' pins in support of a recent initiative to combat workplace harassment. — elCinema.com (@elCinema) 8 января 2018 г. Getting back to the awards proper, in individual categories, Guillermo del Toro won best director for The Shape of Water, the most nominated film of the night. Gary Oldman took best actor (drama) award for playing Winston Churchill in Darkest Hour, while Saoirse Ronan of Lady Bird and Allison Janney of I, Tonya grabbed best actress in a comedy/musical and best supporting actress, respectively. These are largely seen as precursors for the Oscar nominees, due to be announced later in January.